A great vest that fits easily under anything from a golf shirt to a white dress shirt and is totally hidden. 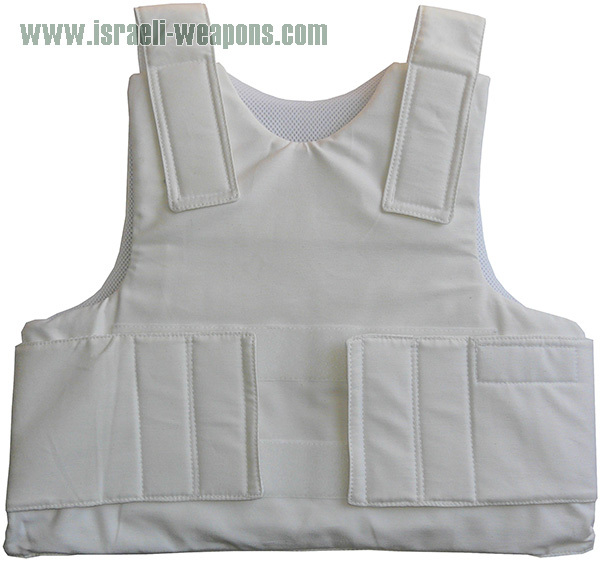 The white color of this vest makes it extremely hard to detect and provides ultimate comfort while securing your safety. This vest has adjustable Velcro tabs to provide maximum coverage without gaping and adjusts for various elements. The bulletproof vest is made of the highest grade NIJ-rated body armor with a rating of lllA/3A which can protect you from rounds from a range of a .22 or .38 up to a .44 Mag. You never know when you may need some extra protection, and a concealable bullet proof vest can supply security while not alarming those around you. You can still dress in style and present a professional profile with the sleek styling of the white bulletproof vest. Helpful sizing chart will aid you in making the right size choice. Velcro tabs help you adjust the vest to fit you perfectly while obtaining maximum comfort and security. I really like it in black. For what the trauma panels? To reduce the impact when you been hit. I don’t think I can wear it under shirt. How much shipping to Brazil? It is good option for concealable bulletproof vest, is there anti-knife protection? I think it is perfect for civilians, not to stand out, really like the stab proof protection added. Will i get warranty and NIJ certification with the vest? And I think it is perfect for undercover.